The last Rocketfest for 2013 was on the weekend of November 10th - as seems to be typical for these days we were met with poor weather, but a good turn-out and lots of crazy rockets! The theme of the launch was Candy rockets - not powered by Mars Bars, but built from the packaging that keeps sugary sweets fresh in the shops. 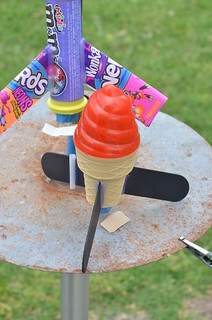 Ross had a fantastically tall rocket made from Mentos tubes and Toblerone boxes and also flew his signature flying-fox rocket. Check out the full album on Flickr including both Photos and videos!